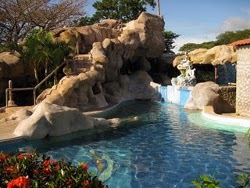 Below the map, you'll find detailed descriptions of the various activities near Las Villas del Guayabo. Just north of the villas on route 164, the town of Guayabo de Bagaces can provide you with all the basics you require for your stay. You will find supermarkets, restaurants, a pharmacy, a bank and other interesting stores in and near the downtown area. Most store-keepers do not speak English. If you forget one of your prescriptions, go to Farmacia Monserrat. Julio (the pharmacist) speaks good English and either stocks what you need or can order it for delivery in 2-3 days. In Costa Rica, most drugs do not require a doctor's visit and there are many generics that are not available in the United States. For your convenience, we have scanned the menus for some of the restaurants in Guayabo. Click on a link and the menu (each a PDF) will open in a new browser tab. Thermomania hot springs has eleven thermal pools, all at different temperatures, a water slide, a childrens' area and a zip-line — a great place to relax. There's a bar and restaurant on-site, but they also allow you to bring your own drinks and food. We'll be happy to lend you a cooler for the day. Their daily fee is pretty reasonable — roughly $10.00 per person — and their bar/restaurant prices are reasonable as well. Driving time: 20 minutes. Yökö offers four thermal pools, all at different temperatures and one with a slide, a kiddie pool, two jacuzzis, and a sauna bath. They also have ramps for people with physical limitations. Driving time: 20 minutes. 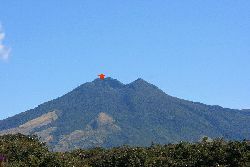 On route 164, north of Guayabo is the town of Guayabal — home of the Miravalles Volcano Adventure Center. 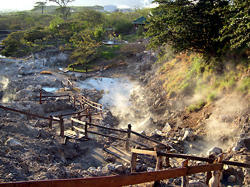 They offer a zip-line canopy tour (1.5 hours) that allows you to view various aspects of the Miravalles volcano. Be sure to bring your bug spray! Driving time: 20 minutes. Rincón Corobicí Rafting provide river rafting trips daily between 7am and 4pm. Trips include a 2-hour float, a 3-hour "Birdwatchers Special", and a half-day float (18km). You'll find them at KM193 on the InterAmerican Highway just past the bridge over the Corobici River. Driving time: 3/4 hour. Our favorite beach, Playa Ocotal, is a great spot for a day trip from the villas. 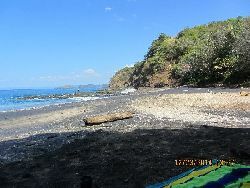 The beautiful, black-sand beach is a short distance from the larger Playas del Coco. Towards the north end of the beach is a spectacular tidal pool, where you can see the crabs and sea urchins that live there — just watch out for the spray when the waves hit! The Auto Mercado grocery (on the right-hand side of the street as you enter Coco) has a wide selection of imported items, like Ghirardelli chocolate and Cuban rum and cigars. Driving time: 1.5 hours. If you’re athletically-inclined, you will spend a &half; day hiking to top … of course &half; day back … or less depending on how many stops you make to take in the beautiful scenery. At the top, you can see all of Costa Rica from the Caribbean to the Pacific. You can even see Nicaragua (Costa Rica's neighbour to the north) and Lake Nicaragua. When you reach the top, you'll have the opportunity to sign the guide's guest register! Contact us if you are interested and note that the guide speaks only Spanish. Driving time: 20 minutes. 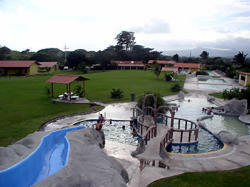 Las Hornillas (the burners) Volcanic Activity Center provides a tour that takes you to the rain forest at the Miravalles Volcano. This is the only live volcano in Costa Rica where you can walk around its crater and experience the steam rising out of its boiling cauldrons. Once you are at the crater, you can bathe in the bubbling mud pools (they take some mud out and let it cool first), or in the bubbling water pools. Also provided is a horseback ride (you can optionally be transported in a 4x4 pickup, or you can walk) to the Miravalles Volcano Private Reserve, where you can experience a 30-minute hike through the primary rainforest. During the hike, you'll encounter safe hanging bridges and winding trails with sheer drop-offs towards the Escondida waterfall. Driving time: 30 minutes. 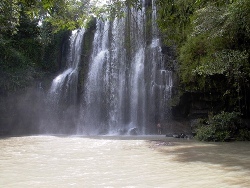 Llano de Cortes (Level of Cuts) is a beautiful waterfall near Bagaces. About 4km west of Bagaces you turn left off of the InterAmerican highway onto a dirt road. Look for the sign on the right and a pulperia on the left-hand side of the road. Follow the bumpy road about 1.3km (0.8m) to reach a parking lot. From there, you follow a steep path to the pool at the bottom of this 50-foot waterfall. You must have a four-wheel drive vehicle in the wet season. Driving time: 45 minutes. 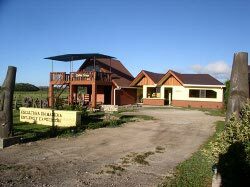 Located off the InterAmerican Highway, just past Safaris Corobici, Las Pumas was created 40 years ago by a Swiss expatriate named Lilly Bodmer de Hagnauer to take in animals who have been affected by development or where captured or injured. Today there are over 80 different animals (22 different species) living in a beautiful natural setting. A donation is requested from those touring the center. It is open daily from 8am to 4pm. Driving time: 3/4 hour. Just north of Guayabo on route 164, you'll find the art gallery and workshop of Tony Jiménez, a well-known Costa Rican sculptor. His sculptures are created from various woods, obtained from trees that have fallen from natural causes and integrate other materials — like bike chains and barbed wire — creating stunning display pieces. Driving time: 15 minutes.